Where did Georges Seurat grow up? Georges Seurat grew up in Paris, France. His parents were wealthy allowing him to focus on his art. He was a quiet and intelligent child who kept to himself. Georges attended the School of Fine Arts in Paris starting in 1878. He also had to serve a year in the military. Upon his return to Paris he continued to refine his art skills. He spent the next two years drawing in black and white. With the help of his parents, Georges set up his own art studio not far from their house. Because his parents supported him, George was able to paint and explore any areas of art he chose. Most of the poor artists at the time had to sell their paintings to survive. 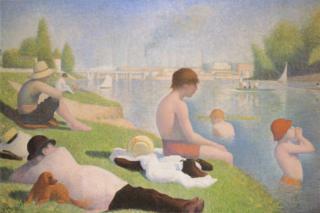 Georges first major painting was Bathers at Asnieres. It was a large painting of people relaxing near the water at Asnieres. He was proud of the painting and submitted it to the official French art exhibition, the Salon. The Salon, however, rejected his work. He joined the Society of Independent Artists and presented his art at their exhibition. Seurat began to explore the science of optics and color. He found that, rather than mixing the colors of paint on a palette, he could place tiny dots of different colors next to each other on the canvas and the eye would mix the colors. He called this way of painting Divisionism. Today we call it Pointillism. Seurat felt that this new way of painting would make the colors appear more brilliant to the viewer. 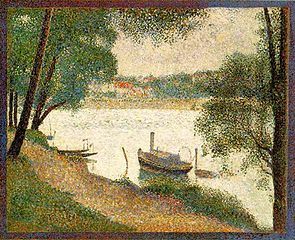 Paul Signac was a good friend of Seurat's. He began to paint using the same method of Pointillism. Together they pioneered a new way of painting and a new style of art. In 1884 Seurat began to work on his masterpiece. 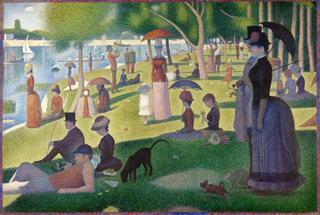 He would use pointillism to paint a huge painting called Sunday Afternoon on the Island of La Grande Jatte. It would be 6 feet 10 inches tall by 10 feet 1 inches wide, but would be painted entirely with small dots of pure color. The painting was so complex that it took him nearly two years of non-stop work to finish. Each morning he would go to the scene and make sketches. Then in the afternoon he would return to his studio to paint until late at night. He kept the painting a secret, not wanting anyone to know what he was doing. When Seurat finally exhibited the painting in 1886, people were amazed. Some thought this new way of painting was the wave of the future in art. Others criticized it. Either way, Seurat was now considered one of the leading artists in Paris. Seurat continued to paint using the pointillism style. He also experimented with lines. He felt that different types of lines could express different types of emotions. He also grew to be friends with other Post-impressionist artists of the time including Vincent van Gogh and Edgar Degas. When Georges was just 31 years old he became very sick and died. He likely died from meningitis. Seurat gave the world of art new ideas and concepts in color and how the eye works together with color. He had a wife and child that he kept secret from his mother. His son died at the same time he did of the same disease. He must have had a great amount of patience to paint such large complex paintings using only small dots of color. His paintings worked a lot like computer monitors work today. His dots were like the pixels on a computer screen. A lot of what we know about Seurat today comes from the diary of Paul Signac who liked to write. His final painting was The Circus.